I think of writing as “wrestling the angels of meaning onto a page.” It’s hard work, and you have to concentrate. Whether you’re writing, revising, or editing, you must pay close attention to your work. That’s what you need to do most of the time. But every writer runs into situations where he or she doesn’t know what to do next. That’s when it’s time to be creative. That’s the time to set your brain free. When I need a short burst of creative thinking, I either eat pistachios or go for a walk. Both activities set my mind free to come up with new ideas and solutions. Your brain can’t be creative and logical at the same time. That means you must quit the concentrated work so your brain can do creative work. The best way to do that is to give it almost nothing to do. You need an activity that puts your body on autopilot and lets your mind roam free. You can take a shower. That’s why so many people have great ideas in the shower. You can do almost anything that doesn’t need much thought, like simple housework. My two favorites are eating pistachios and walking. If you’ve ever eaten pistachios, you know the drill. Pry open the shell, get the meat out, and eat it. Then you move on to the next shell. Then the next. It’s not exactly work that requires a high level of concentration. I eat pistachios when I need a solution to a small issue. 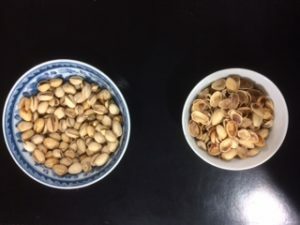 I keep a bowl of pistachio nuts in my office, right next to a bowl for the shells. When I set my body to eating the pistachio nuts, my brain doesn’t have much to do. That’s when it’s likely to come up with something creative. When my brain comes up with something great, I capture it on my digital voice recorder, or I refine it. Sometimes I do that by writing. Sometimes I draw a mind map. The big plus of eating pistachios (besides the fact that I love them) is I do it in my in my office. I have all my writing and reference tools nearby. Sometimes though, I need to let my mind go free for a longer period of time. This is not hiking or power walking we’re talking about. It’s the kind of walking that Thoreau called “sauntering.” That kind of walking is automatic and leaves your brain free to do something creative. A warning. Be sure you walk in a place where your brain doesn’t have to do a lot. When you walk in a city, you must watch for pedestrians and cars and pay attention to traffic signals. If you can, walk where you don’t have to do those things. There’s research that says walking in nature is good for your health, too. When you get stuck, your brain needs a break from concentrating. Do something that occupies your body but leaves your mind free to roam. I suggest two things. Have one activity that’s indoors and near all your references and tools. Have another that gets you out and lets you experience walking, a writer’s great friend.